I was able to get a hold of and digitize the Boston precinct results for this race (maybe 189 of the 270 precincts in this race, though I only get 187 to merge with the Boston precinct shapefile [Edit: One of the oddities may be Long Island; the other is Ward 5, Precinct 2a in the unofficial election results]) without too much trouble. 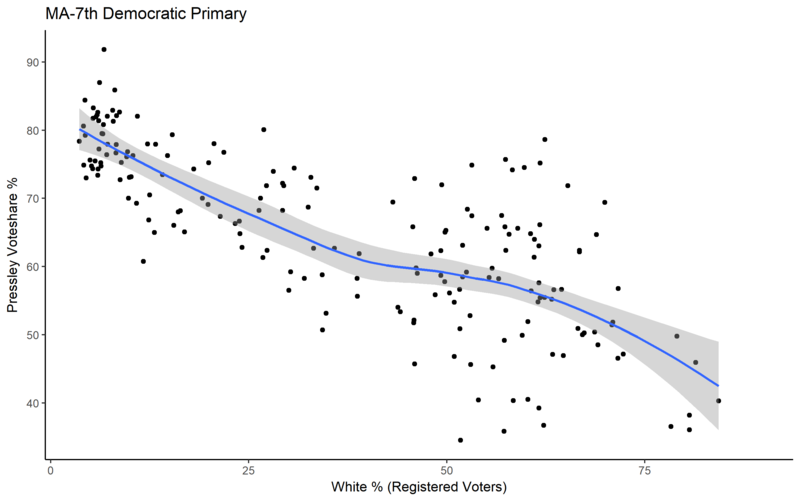 And since I have a Boston voterfile on my computer for research, I can link these precinct results to average precinct demographics among registered voters, like age (from birthdate) and predicted race. The maps of precinct results show mostly what you’d expect (white Neighborhoods like Charlestown and Brighton’s Oak Square were better for Capuano than the city as a whole; Black neighborhoods like Roxbury/Mattapan/Dorchester’s Fields Corner much better for Pressley). 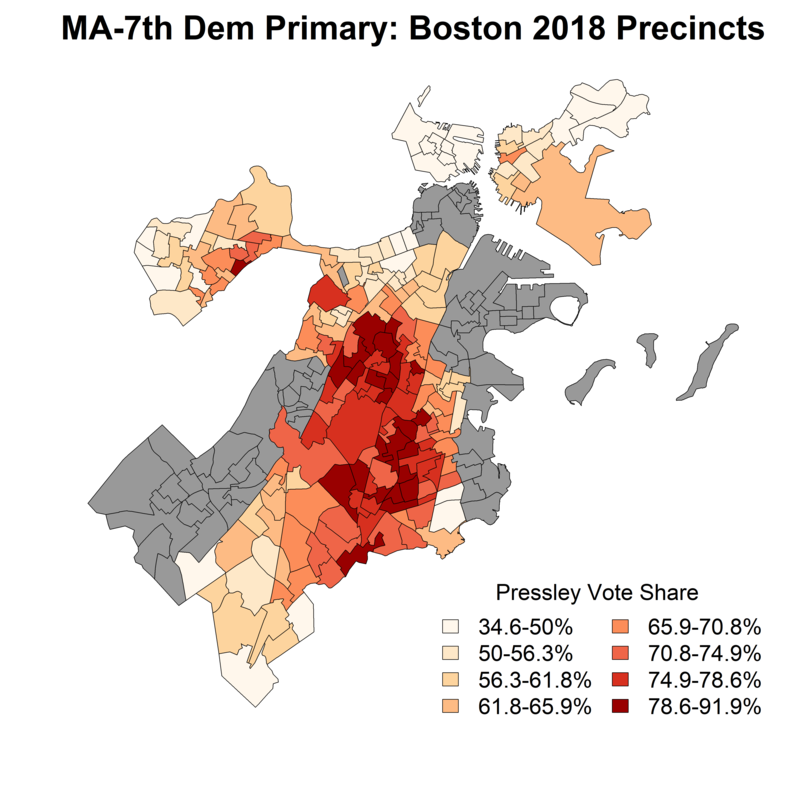 But Pressley did really well everywhere in Boston, and never gets less than a third of the vote (while Capuano gets <15% in some precincts). 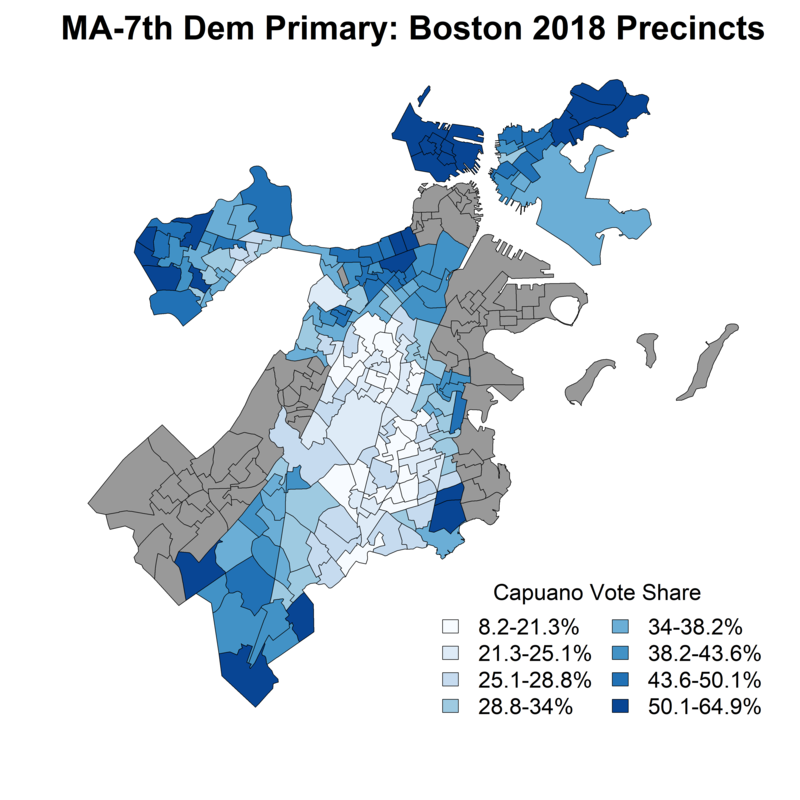 East Boston shows up as a relative bright spot for Capuano, which seems odd given the Hispanic predominance of that area (though Capuano also won Chelsea and non-Hispanic whites likely comprise a bigger proportion of the electorate than the population). 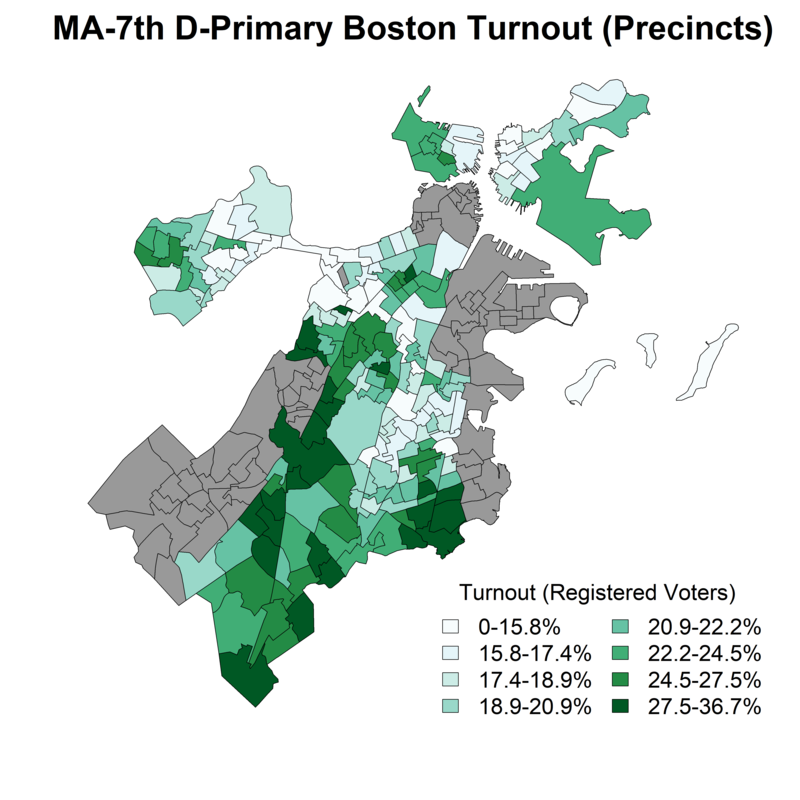 I can’t tell too much from the turnout map, though maybe it shows that college-heavy precincts (like around BU and Northeastern and maybe those Longwood-area college campuses) have less turnout (which is consistent with what I find with age and regression later). 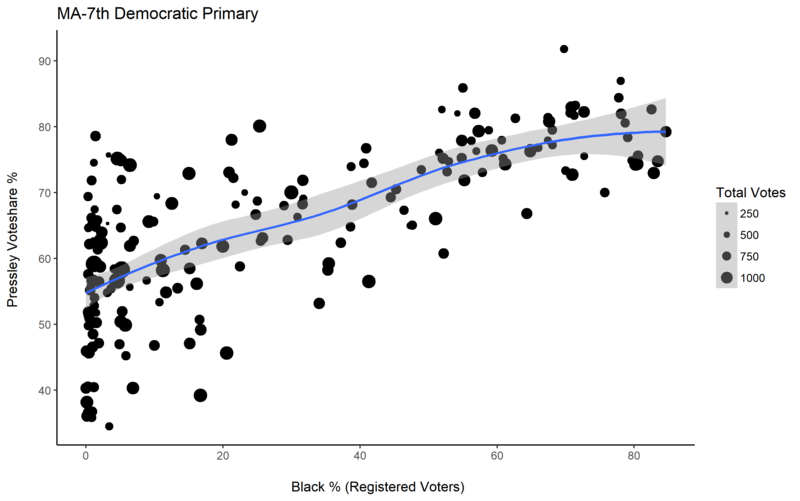 Precinct-level regressions indicate that precincts with larger proportions of Black voters, Hispanic voters, and younger mean age gave a higher vote share to Pressley. 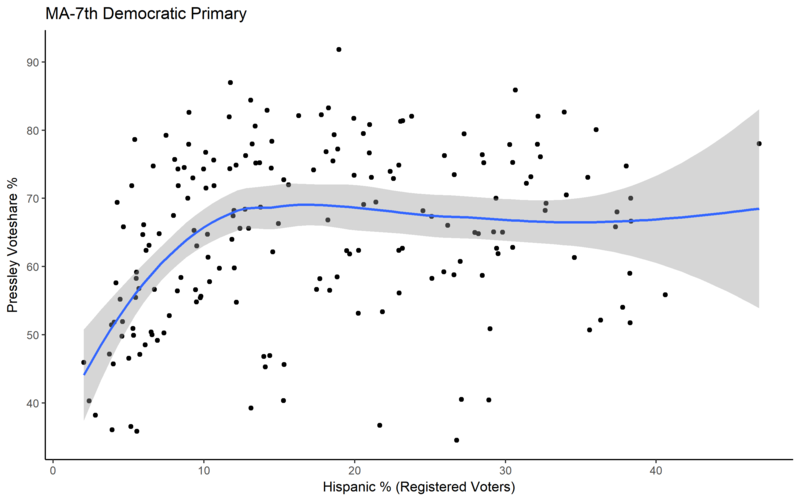 Higher Hispanic percentage predicted lower turnout, precincts with an older average voter had higher turnout; association for Black percentage on turnout was null (no association with turnout conditional on Hispanic percent and mean age).